How it works: writers (graduate students and others) register by email, show up at 9:00 a.m. in Killam B400, and tell the group what they will do that day. Writers return at 4:00 p.m. and tell the group what they accomplished. Special feature this year: on Tuesday and Wednesday a.m., we will use the Pomodoro technique (writing in 25-minute spurts in the same room as other writers) to see if that gets you writing. If you would rather continue to write in your own space, that’s fine. Thursday a.m. will be an opportunity to peer edit and ask questions. 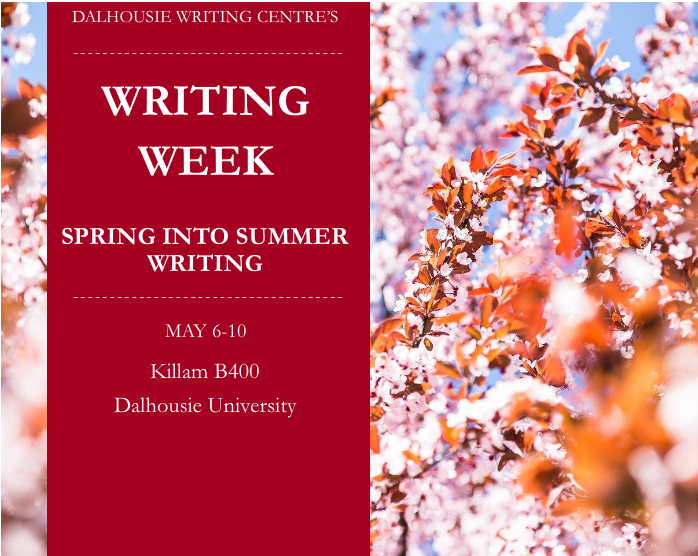 Please note: Writing Week is open to all Dalhousie students (or faculty or staff if they want to) who need to get a document written. Perhaps the most important relationship you have as a graduate student is with your supervisor. Good student-supervisor relationships are associated with higher completion rates and faster times to completion. The relationship requires clear communication and shared expectations. Easy to say, but not always easy to do. Join the Faculty of Graduate Studies for this half-day conference to explore the dynamics of the student-supervisor relationship and how they can be optimized. This event is for you whether you’re a new graduate student who wants to learn strategies and best practice or an experienced graduate student who wants to share what you’ve learned. Calling all RAs, TAs and graduate students: our annual Research Bootcamp starts in May! We are working to develop a voluntary Standard for Psychological Health and Safety for Post-Secondary Students. This Standard will create a consistent evidence-informed approach for any post-secondary institution across Canada to implement. Set to be released in early 2020, it will support #studentsuccess by promoting and strengthening student mental health. We are encouraging dialogues across the country until May 31, 2019. Your participation will not only help raise awareness of the project but also help ensure that this Standard is informed by perspectives from across the country. We greatly appreciate all the time and effort you dedicate to this cause. The MHCC and the CSA Group gratefully acknowledge the funding support of Bell Let's Talk, The Rossy Foundation, the RBC Foundation, and Health Canada in developing the PSS Standard. Other key partnerships include but are not limited to Universities Canada and Colleges and Institutes Canada. Get involved: visit our webpage (https://www.mentalhealthcommission.ca/English/studentstandard) to access FAQs, Scoping Review Summary, contact info, events and more. Follow project-related updates on social media, using the hashtag #studentsuccess. 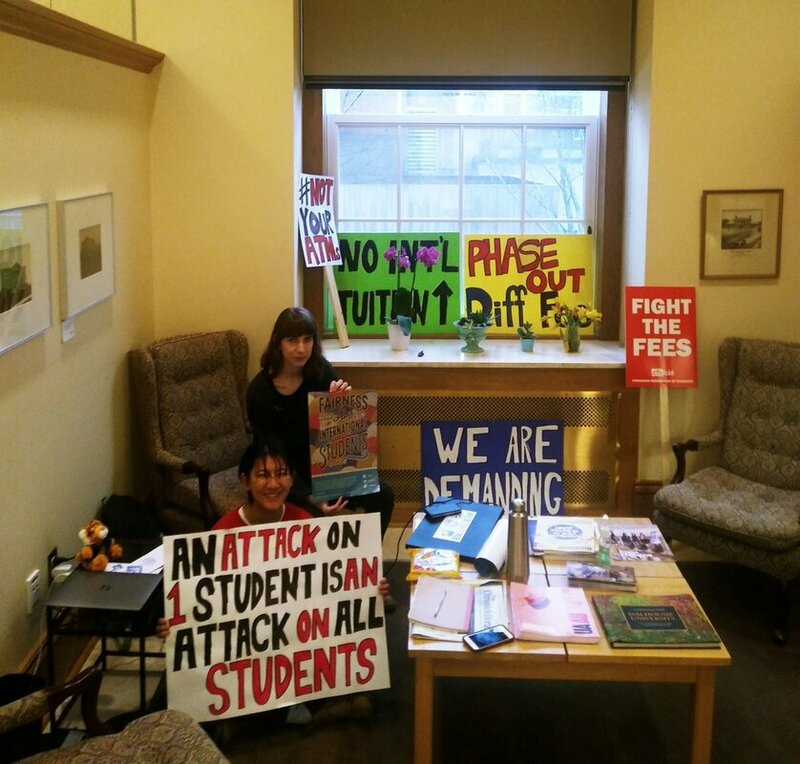 It's the start of Day 5 of our sit-in with @daldisa in the @DalPres office. Tomorrow is the @DalhousieU Board meeting - we need a #NewBudgetNow without the 44.4% international student tuition hike and a 5-year plan to phase out int'l differential fees. Students have now been sitting-in for 25 hours and even though Interim President Peter MacKinnon is back in the office today, he is refusing to engage with students or commit to meeting our demands. We will continue holding this space until Dal releases a new budget without the 11.1% tuition hike for international students and a 5-year plan to phase out international differential fees. Sit-in Day 3 with @daldisa in the @DalPres office! We're still only allowed to have 2 students inside the office, but we'll be in here and in the hallway outside all day and until @DalhousieU meets our demands for fairness for international students. Follow us on Twitter @dagshfx to keep up to date with the protest! ​Do you want to show solidarity for international students but can’t attend the sit-in? Take a couple minutes to tell the Dalhousie Admin your thoughts in the budget! "Hello! As a Dalhousie domestic student I stand with International Students and am in support of their two asks. The first is to propose a new budget that does not increase tuition for any student and the second is to phase out differential fees. I look forward to seeing a new budget at the Board of Governor's meeting next week and hope Dal priorities International Students as well as the commitment to diversiry and inclusion moving forward. I also think it is important that students be let into the presidents office and are able to have their voices heard. Have a great day!" Students are back at the Dal President's office for the 2nd day, but - despite claiming to be listening to students - the admin have locked us out! We're not leaving until we get a new budget without tuition hikes + a 5-year plan to phase out the international differential fee. Petitions + Rally + Sit-in = Action! Students are demanding a new budget proposal from Dalhousie University!! International students are not ATMs and deserve better. The proposed increase of 11.1% for 4 consecutive years is UNACCEPTABLE! We are in solidarity with Dalhousie International Students' Association in demanding a new budget proposal immediately and a commitment to phase out international differential fees in 5 years! 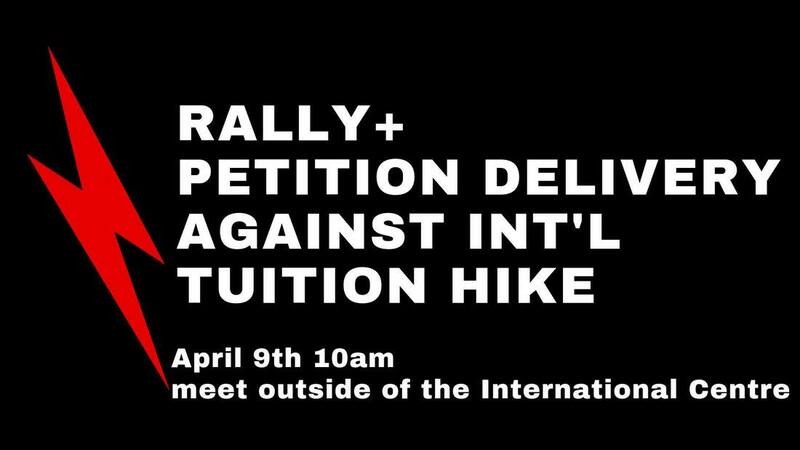 Come out and join the rally against international tuition hike! Dalhousie University has proposed a 4-year plan of an annual 8.1% increase in international tuition, on top of 3 % domestic hike. This is totally unacceptable and we need to put pressure on Dal that they cannot keep taking advantage of us. Let's show Dal that we, international students, are against this proposal and that we have a voice! Meet us on Tuesday, April 9th at 10 am outside of the International Centre. Then we will make our way to Henry Hicks for rally and petition delivery.